Mining vehicles giant Komatsu has created what it describes as a “center of excellence” for its massive autonomous haulage trucks. The company says the new facility brings together product, technology and service experts from across the company. Montratec has unveiled what it describes as “revolutionary and sensational automation technology” at this year’s Automate Show. At the automation technology trade fair, the US-positioned German company demonstrated several new product developments of their future-oriented automation and transport system “montrac”. 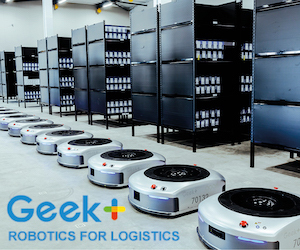 Geek Plus Robotics says it is receiving high levels of interest from heavy industry for its supply chain automation technologies, which are currently being showcased at ProMAT, in Chicago. A spokesperson for the company says the specific products generating the interest are its autonomous forklift truck as well as its M1000, which, as the name suggests, is a warehouse mobile robot with a payload of 1,000 kg. The driverless forklift’s payload is 1.6 tons. RightHand Robotics, a provider of autonomous robotic piece-picking solutions, has released its RightPick2 solution, the company’s next-generation, integrated software and hardware product platform. 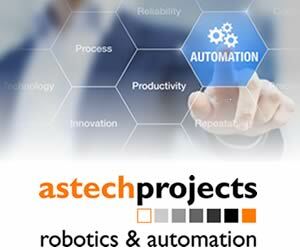 The launch was made at the ongoing ProMat Show in Chicago, a major showcase for material handling automation for supply chain, distribution and manufacturing. inVia Robotics, a provider of warehouse automation solutions for e-commerce, has expanded the application of its Picker robots in additional Rakuten Super Logistics warehouses across the United States. Following the success of an initial installation in 2018, RSL will roll out inVia’s automation technology for picking across its fulfillment network.